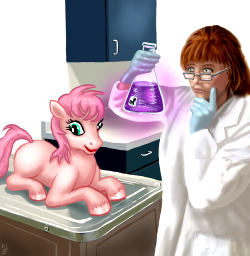 The Unicorn Jelly Forum • View topic - I have finally brought my writings to Jenniverse! For the past many months, under the pen-name of 'Chatoyance', I have been very busy writing the best work of my entire life. I have created over 700,000 words, all within the Conversion Bureau mythos. This is not simple fan-fiction, though it does borrow some elements of the universe of My Little Pony: Friendship Is Magic. These are hard-core, science fiction literary stories that explore the nature of identity and self, set in a desperately realistic near future earth facing obliteration by an expanding pocket cosmos. Originally written on http://www.fimfiction.net/, I am gradually moving them to Jenniverse.com to preserve them, and to make them available from another source. These are extraordinary tales, spun from a humble source into something unique. Re: I have finally brought my writings to Jenniverse! Since you have a safe place to write now, does this mean we'll be hearing from you again? I've always enjoyed reading your works, and I know you find fulfillment in being able to be creative, so I look forward to more. Das wurde aber auch verdammt noch mal Zeit! I am working on that very issue. I am hoping that by doing this little project I can fix whatever inside me was hurt by the trollish events on FimFiction. I am not well suited for living among humans, I guess. I am not well suited for living among humans, I guess. they have a camouflage made of human skin, very useful in the wide of the web of this world. Look at "lost and found". RaharuAharu wrote: D: What happened? Long story short, the trolls that have plagued her for years figured out that Chatoyance = Jennifer Diane Reitz, followed her to fimfiction, and have found every excuse to slam her stories, going so far as to put together a group dedicated to it. sigh. What kind of vain, horrid lives drive a person to hound someone for years. More so a person who has NEVER done them harm, in any way shape or form. Edit: Yep just looked it up, the people doing this are pretty much the personification of all the bad things about humanity. Tribalism, xenophobia, hate, and all given bravery and form via the anonymity of the internet. Hey, I'm not "into" the whole "pony" thing either. But Jennifer writes darn good sci-fi fiction, regardless of the setting, so I read it! I am doing my best to do so. At the very least, I am working on freeing myself from the spell of Equestria, so that I can generate my own cosmos, and reconstruct my Pony stories around it instead. Jennifer Diane Reitz wrote: I am doing my best to do so. At the very least, I am working on freeing myself from the spell of Equestria, so that I can generate my own cosmos, and reconstruct my Pony stories around it instead. I really hope you do! I check in every so often to see how you're doing, and this is my sincere hope! Your universe is so far and away the most imaginative and original I have ever encountered. There's real magic here, and don't you ever forget it. Two "Yay"s, one "Hey!" and an essay. Still counting. Monocheres wrote: By the way the above was penned by a cheela who earned a bit of fame in certain circles. Brilliant. Quite a dedicated following. She was originally hatched as an androcheel but she really felt all the way round her neural ring that she was a gynocheel. (Getting all her spermatophorae everted into oviducts was quite an involved operation, let me tell you!) Lived a long life (more than an hour and a half!) most of it as a gyn. Extremely creative in wonderfully weird, and weirdly wonderful ways. Although in later minutes she sometimes needed the occasional figurative EMP from her friends to encourage her to think a little more outside the fence. Hit kind of a slump around the 50-minute mark. I mean, how could a cheela who was once so radical let herself get so ... conventional in her thinking? Luckily, she snapped out of it. Might have taken her a couple minutes to get out of the funk ... but get a load of her later works! They conquered gigagravity, man! Is there a reading order for these stories of yours? Or can they be taken from any starting point?